Don’t just attend BU – live it! Choosing to live in residence means involving yourself in a community of people who are about your age, share your interests, and are all at about the same stage in their lives. Read what one of our Residents had to say about why Living in Residence at Bishop’s is one of the BEST decisions you can make. Why should you live in residence? If you ask any number of Bishop’s students you’ll probably get a million different reasons, from meeting so many wonderful people that become lifelong friends, to not having to worry about cooking for yourself. There are so many other reasons in between, but here are just 3 of reasons to live on campus! The first reason is because of how convenient it is. Living on campus allows you to be right in the middle of everywhere you need to go. You’re always right by the Plex so you never have to make a long walk home after a workout, you’re right next to Dewies so you won’t have to stray too far to get a quick lunch before class, and you’re only a minute walk away from the academic buildings so you won’t have to worry about walking in the cold for too long in the winter. Living on campus allows you to be so close to everything, and when you want to go off-campus, you’re still no more than a 10-minute walk away! The second reason to live on-campus is for the inclusive community atmosphere. When you live in rez, you’re literally living with between 20-40 people on your floor alone (no matter which rez you live in), and over 100 students in the building as a whole. When you live with such a large number of fantastic people, you can’t help but to befriend some, if not everyone. Whether it be just having a conversation while doing laundry, bumping into each other in the hallway, or bonding over similar interests at one of the awesome events that your RA has organized for everyone, you are constantly meeting new people and learning more about those you live with. 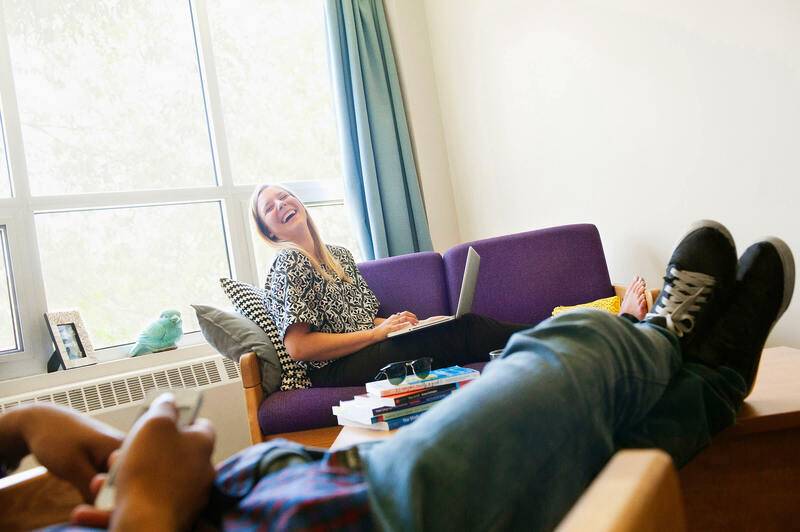 When you choose to live in residence, you are putting yourself in a welcoming and open community. Last but certainly not least, a third reason to live in rez is for the memories that you will make at the fun events organized for residents, or the plans you make with the people you meet. From Orientation Week, to the day you leave for summer break, you’ll make so many great memories. Whether those memories be from that night when your RA planned a game of Cards Against Humanity and you all realized how wonderfully weird you all are, or of nights when you and a couple friends had an intense Mario Kart tournament in the Mackinnon common room. These memories are ones that you’ll hold with you and look back on as you continue your years at Bishop’s and long after you leave. Read what our former Dean of Student Affairs, Dr. Jackie Bailey has to say about living in Residence. See the advantages of living on campus. Details on the Residence Halls.